One of the biggest safety advances in cycling in recent years has been the adoption of LED lights, which offer brighter output in ever smaller sizes. Manufacturers have been able to shrink lights while offering long run times at high output levels. The brightest all-in-one unit offered from Niterider is the Lumina 700. (I previously tested the MiNewt 600, which earned high marks.) 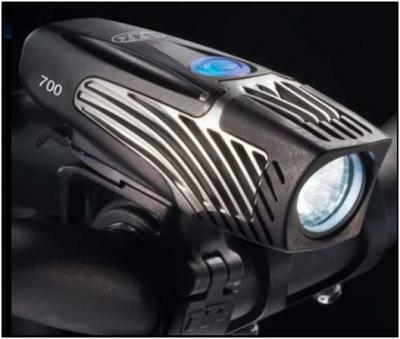 The new 700 unit adds increased light output while actually decreasing size and weight. The light has four main modes: low, medium and high, plus a very useful flash mode that I found ideal for daytime riding. To demonstrate the brightness of the Lumina 700, I shone the light on my garage door at each setting from approximately 40 feet away. The photos show the results, left to right: lowsetting — 200 lumens output, claimed runtime of 5 hours, 30 minutes; medium setting — 350 lumens output, claimed runtime of 3 hours; high setting — 700 lumens output, claimed runtime of 1 hour, 30 minutes. On the road, on my workday commute, I found the lowest level to be acceptable for speeds of up to 20 mph (32.2 kph). Faster speeds meant that I could outrun the beam. Medium worked well for most of my commutes. But on the darkest mornings I was happy to have the high setting, which proved itself capable of lighting both the road in front and also dispersed bright light to the sides, allowing me to easily see potential road hazards off my line. Not only did I feel very visible to motorists, but the high light output meant I felt safe riding at any speed I was able reach on the bike. Switching between the different modes is easy to do, even when wearing gloves on winter morning commutes. The power button, located on the top, center of the light, is large and simple to press. Each press of the button allows you to quickly cycle between steady light modes; holding the button for about four seconds will enable flash mode. Switching off the light is a matter of holding the power button for a couple of seconds. One feature I really liked is that the power/control button contains an LED indicator light that flashes blue if more than 25% of the battery charge remains and flashes red if the remaining power is below that level. It’s a feature common across all the new 2014 lights I tested from Niterider, and I found it to be a very handy reminder. It allows you to quickly choose a lower or flash output in order to extend the light’s runtime. Recharging the Lithium-ion battery is easy using the supplied mini-USB cable that can be plugged into your computer or a wall outlet with an adaptor (not supplied). And claimed charge times, like runtimes, seemed to be accurate. One downside of this and most rechargeable Li-Ion lights on the market today is that the battery cannot be replaced by the user. Also supplied is a helmet mount which I did not test for this review. Niterider has improved the handlebar mount since I tested the MiNewt 600 previously. The mount on that light had a tendency to slip. The new screw mount on the Lumina 700 fixes securely in place and never moved, even on the bumpiest of tarmac. The Lumina 700 is another winning design from Niterider. High output from a self-contained, easily chargeable and simply operated light with adequate commuting runtimes and a secure mount leads to a very safe on-the-road feeling.